UK music startup ROLI are on one heck of a roll. And they’re slowly becoming a laboratory for trying out genuinely new ideas for music making – finally breaking the mold of an industry that often relishes nostalgia. Now, ROLI’s got the engineering, acquiring plug-in maker FXpansion and cross-platform development architecture JUCE. They’ve got the flagship hardware, in the form of their Seaboard and Seaboard RISE expressive controllers – futuristic gadgets that look like the piano someone would play on Star Trek: The Next Generation more than what you’d find in your local Guitar Center. And they’ve got connectivity to bring it together, like the Noise app that puts touch-sensitive control on your iPhone, and Blend, an online collaboration platform. Instead of waiting for the future of music making, in other words, ROLI will acquire and invent it. The latest development is BLOCKS. They’re sleek, black boxes that work together wirelessly. And they’re different than what you usually see in three important ways. First, because they’re modular, they aren’t the usual crowded combination of knobs and pads and buttons and faders that most often are the mark of music gear. Second, they’re arguably the first music gear that seems to look comfortable sitting next to something with the industrial refinement of an iPad Pro. And lastly, most importantly, there’s nothing about this device that suggests it’s built for a musician. A unit called the Loop Block resembles the remote for an Apple TV. 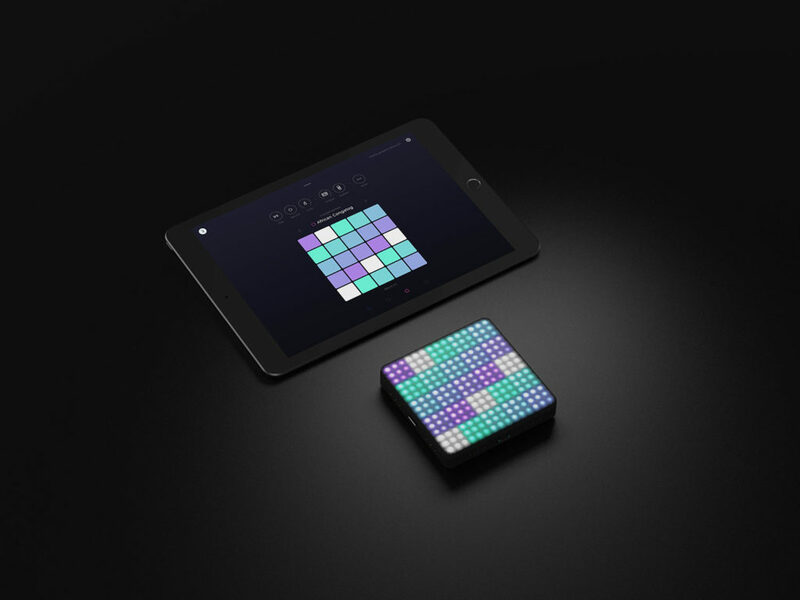 The Lightpad Block looks like a small light-up toy or piece of LED jewelry. The idea is this: consumers buy the boxes they desire, then add them wirelessly in any combination to an iOS device that makes sound. Since they connect via Bluetooth, you skip the wires. On their own, these gadgets do genuinely appear too simple. But the magic appears to be breathing intelligence into them with software. 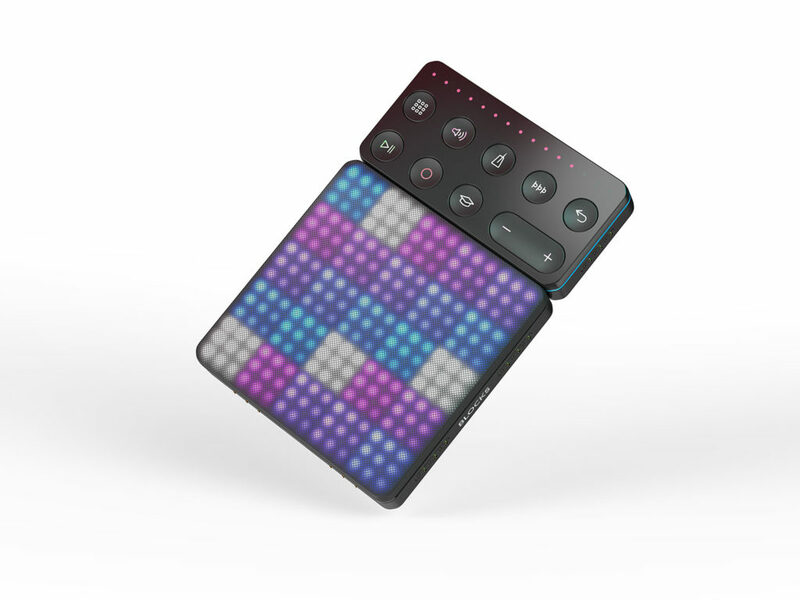 The Lightpad Block, true to ROLI’s core competency in touch interfaces, is sensitive to contact and gesture, evidently opening up various interactions. The Loop Block mainly serves as transport control, but seems to hold some potential when combined with other Blocks. They’re small enough that they’d even make sense along a phone, not just a tablet. As a lot of the world’s markets shift to handheld platforms and not traditional computers, that could be a real sign of things to come. Phone friendly. Darned cute devices. Here you can watch the first two instruments in action. It’s the creative use of gestures that really sets this apart. We’ve seen ideas like that in apps or one-off experimental products, but here it’s part of a consumer-focused product – which is newsworthy. On the other hand, the general public has embraced the multi-touch paradigm, so this could all be ripe for disruption. For now, you get only these two units. And they’re roughly the same price of some other entry-level music controller (even if they look nicer) – that’s US$$179 and $79 for Lightpad and Loop, respectively. So I think the real verdict will be down to how the app and controllers evolve. I’d also be hopeful that ROLI opens up this device to developers – that seems a no-brainer, given the company’s openness to third parties on Seaboard and its investment in development technology JUCE. In other words, even if you aren’t sold on ROLI’s own app, another app might change your mind. (I’d like to use the Lightpad Block with the Elastic Drums drum machine, for instance.) Also, since they’re Bluetooth enabled, I hope we’ll be able to use them on desktop computers, too. These ideas may all be independent of the core market and simplicity, but … looking at the history of tech like multitouch, the Wiimote, and Kinect, advanced experimental applications have often informed the mainstream, too. But there’s another reason to look to ROLI to boldly go where no other musical instrument manufacturers have gone before. 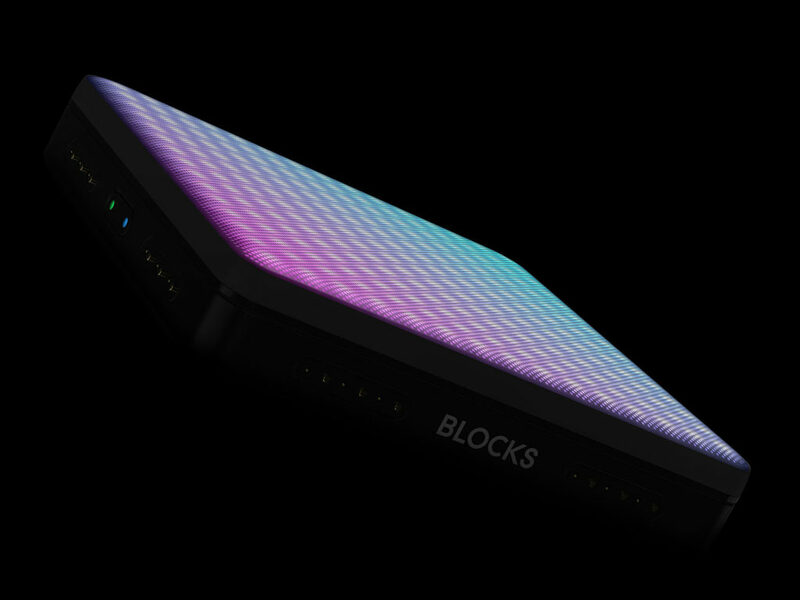 And most interesting about the ROLI Blocks initiative is that the whole thing will be sold exclusively direct from the company and through Apple. That’s right – Apple Stores will have these gadgets, in retail locations and online. I think that’s potentially a game changer. Music stores are unfriendly places for a lot of people. Heck, even some of us actual musicians avoid going to some of them like the plague, thanks to unfriendly staff and people playing Stairway to Heaven. But seeing these alongside iPads could open up physical hardware to a whole new audience. Having thoroughly trashed Apple for the last days for narrowing the appeal of their desktop Mac line, I have the reverse take on their mobile iOS stuff. I think they remain in just the right position to turn people on to making music on their mobile gadgets. I’m not being hypocritical somehow, either – you can contrast the absence of inspiring desktop hardware with the much more inspiring combination of, say, an iPad Pro or an iPhone 7 with something like Lightpad Blocks. Something like it, anyway. I’m excited to try these out in person. CDM will hopefully be visiting the folks at ROLI before the end of the year to catch up on all they’ve been doing. If there’s something you’d like to see us cover, questions you’d like to ask, even something you want to criticize, let us know.